Is this real-world Lenovo foldable phone what Samsung is working on right now? The Samsung Galaxy F foldable smartphone, aka the Galaxy X, is being worked on right now due for a reveal in early 2019. Now a video showing off a competitor's version of the phone reveals what we could expect, and it's really impressive. The video shows off an unnamed Lenovo smartphone, which appears to be at a trade show. The handset has a hidden hinge that can be seen on the side as the handset is folded. The screen itself appears to seamlessly bend to fit the frame even with the screen on and working. This does still look like a prototype model with those large bezels and thick frame making this feel like a step backwards in smartphone design development. But of course this does add a newly developing folding technology, so this design drop is expected. 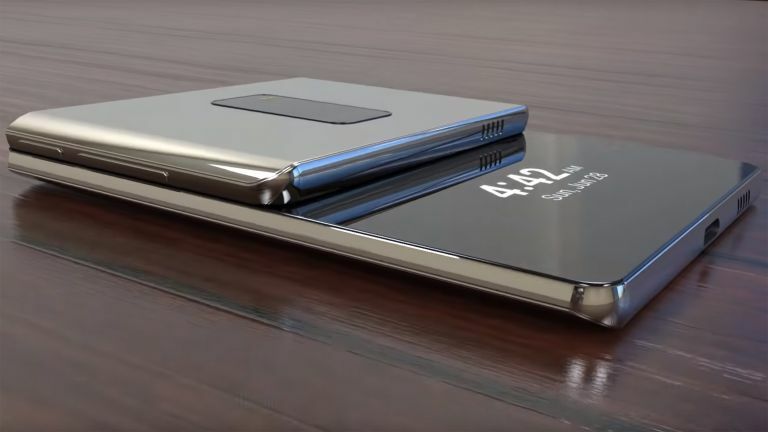 However we'd imagine that Samsung, as a screen manufacturer, will splash out more on creating a better looking final product for its Galaxy F.
Samsung has already said it wants to be the first to release a true folding smartphone so expect to see the Galaxy F early in 2019 with a fancy feature that makes it a unique model. That'll then let Samsung claim this is the first – even if beaten to release by another manufacturer – since it will be a "true" folding phone. Perhaps this could be an ability to flex further than the competition. Also clear from the Lenovo demo is that the screen there is separate to the phone body, which you can see at the bottom looking grey. Including the handset's brains with the display into one folding unit is the real challenge that, hopefully, Samsung will master for its Galaxy F foldable phone. But while Lenovo and Samsung are focused on building folding phones, rival OnePlus is looking to dramatically shrink the notch at the top of its almost edge-to-edge screen – schooling Apple and the chunky cut-out on the iPhone XS in the process.